PRAYAGRAJ, India — Every six years, tens of millions of Hindus pour into the northern Indian city of Prayagraj to take a holy dip in the Ganges River. The festival is called the Kumbh Mela, and in its different forms it is consistently the biggest gathering of humanity on the planet. It is nearly impossible to take 20 steps along the pilgrimage route without passing a huge sign featuring Mr. Modi’s face or the grinning visage of his close ally, Yogi Adityanath, the monk turned chief minister of this state, Uttar Pradesh. They aren’t technically campaign ads, but billboard after billboard trumpets their accomplishments in all areas of life. Here’s Mr. Modi on a super-bright video screen talking about his Clean India campaign, the bluish glow lighting up countless pilgrims sleeping on the ground. There’s Mr. Adityanath grinning from the side of a water truck, welcoming visitors — an estimated 35 million of them on Monday alone. 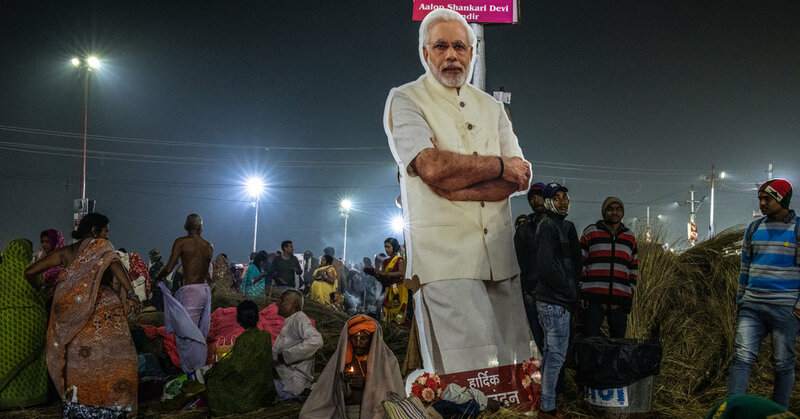 In India, politics and religion are often inseparable, especially with Mr. Modi’s Hindu nationalist bloc, the Bharatiya Janata Party, in control. He and Mr. Adityanath, who is considered even further to the right, have expanded this Kumbh into a $ 600 million affair that brought nine new highway flyovers, 22 pontoon bridges, 150 miles of roads, 20,000 trash cans, 40,000 LED lights, 122,500 toilets and one new airport terminal. The timing is a gift. National elections are expected in April or May, and in recent months, Mr. Modi and the Bharatiya Janata Party, or B.J.P., have come under withering fire for troubling weaknesses in India’s economy and for allegations that Mr. Modi tried to suppress data showing India’s unemployment rate soaring to a 45-year high. But at the Kumbh, most everybody is Hindu and most seem perfectly happy benefiting from the state sponsorship of their religion, even as other communities are suffering out of sight. For example, months ago, to ensure the Ganges was as clean as possible for the busloads, trainloads and masses of Hindus coming for their spiritual immersion, Mr. Adityanath went after the tanneries that line the Ganges upstream from Prayagraj. The tannery business is dominated by India’s Muslim minority and lower-caste Hindus who do not subscribe to the same strict rules about cows that some conservative Hindus follow. But conservative Hindus are the B.J.P.’s base, and Mr. Adityanath ordered the tanneries closed for three months, the longest anyone can remember. Some tannery owners even went to court, but they were effectively shut down. Now, as tens of millions of Hindus celebrate the Kumbh, countless Muslims and lower-caste tannery employees are out of work. “This is done purposely just to hurt one segment of society, the Muslim community,’’ said Taj Alam, vice president of the Uttar Pradesh Leather Industry Association. Mr. Adityanath is a powerful figure in India, perhaps second only to Mr. Modi. His job is a big one: Uttar Pradesh, India’s most populous state, contains 230 million people; it would be the fifth-largest country in the world. Once the commander of a brawny Hindu youth brigade, Mr. Adityanath is also one of India’s most divisive politicians. He is on record making derogatory statements about Muslims and saying he was ready for religious war. He is also fiercely disciplined, and so is this year’s Kumbh. According to Kumbh regulars, this year’s festival is much cleaner and better organized than previous festivals, and many pilgrims gave Mr. Adityanath credit. The traffic flows more smoothly. There are no beggars in sight (police officers said they had been banned). There isn’t even much litter — street cleaners seem to sweep up the empty water bottles and snack wrappers the instant they are dropped. There are even riverside changing rooms — a first — so pilgrims, especially women, can have a little privacy. “This is the best Kumbh yet,” said Brijlal Mishra, who sells solar panels in Mumbai, about 750 miles away. Mr. Mishra did not have an issue with the government’s spending spree. “They are helping us in our faith,” he said. It is not unusual for state governments to assist pilgrims. This year, the government of Madhya Pradesh, which is run by the Congress Party, a rival to the B.J.P., is covering nearly $ 1 million in travel costs so that thousands of pilgrims in that state can celebrate the Kumbh. But critics of the B.J.P. say this is nothing compared with the spending of B.J.P.-led governments, such as the one run by Mr. Adityanath. Officially, Mr. Adityanath’s administrators have rejected accusations of misusing state resources or playing politics with the Kumbh. But privately, several called the display of largess a waste. The Kumbh Mela is one of the holiest events on the Hindu calendar, its date determined by astrology, its auspiciousness derived from a certain line up of Jupiter, the moon and the sun. It is celebrated in four different Indian cities, each on their own 12-year Kumbh cycle, and it usually lasts several weeks. The name Kumbh Mela comes from the Sanskrit word, kumbha, for pot or water pitcher, and mela, meaning festival. In a cherished myth, a Hindu god was carrying the nectar of immortality in a khumba and spilled drops in four different places — the four cities where the Kumbh is held. But this year’s festival in Prayagraj, which started in January and runs until early March, is not even a full Kumbh — it is considered a half Kumbh. The half Kumbh tradition started years ago when Hindu holy men would meet every six years, halfway between the full Kumbhs, to keep their dialogue going. But a few months ago, Mr. Adityanath declared that there is nothing incomplete in Hinduism, and the word half “doesn’t gel with this philosophy.” So, with a stroke of his pen, he upgraded the celebration of this half Kumbh into that of a full Kumbh and went on to spend three times as much as on Prayagraj’s last full Kumbh in 2013. He also recently led his cabinet of about 25 ministers in a ritual bath in the Ganges, which, longtime Kumbh watchers said, had never happened before. At the Kumbh, it’s all about the dip. In Prayagraj, during this festival, Hindus believe it is auspicious to immerse themselves at a specific point where the Ganges joins two other rivers, the Sarasvati (a mystical one) and the Yamuna (a real one). But actually getting into the water is easier said than done. It is nearly impossible to strip down in a packed crowd with just a few inches between you and the next person, no place to put your stuff and an undulating wall of a million human beings at your back.